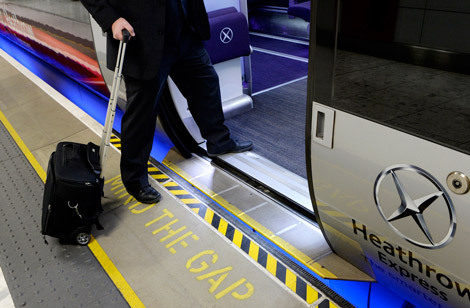 Heathrow Express has installed platform gap-fillers at its stations to reduce the risk of passenger accidents. The rail company is the first in the UK to fit the devices along the edge of station platforms, reducing the size of the gap between the train and platform edge. The gap-fillers also enhance access for disabled passengers and will be installed at all Heathrow Express train stations by the end of May. “Stepboard” accidents — when someone falls between the train and platform edge — are responsible for 48 per cent of the overall fatality risk to passengers, Heathrow Express said. A year-long trial at Heathrow Terminal 5 station found there were no incidents wherever gap-fillers were in use. Joanne Lewis, Heathrow Express’ head of safety, said: “Our top priority is ensuring Heathrow Express, and the rail industry as a whole, is as safe as possible for customers and employees. The platform gap-fillers are designed by Australian company Delkor Rail.